The United States Mint has issued official commemorative coins over the last 125 years, to celebrate and honor important people, places, events, institutions and causes, struck in precious metal as monetary art. Authorized by Congress, commemorative coins are legal tender, but they are not intended for general circulation, they are struck only in a limited quantity and are only available for a limited time, making them very desirable. Most commemorative coins have some socially-popular and historical significance behind them, creating interest among many people who would otherwise have little to no interest in collecting coins. Commemorative coins are very popular and a great way to get started in the hobby of coin collecting, known as “Numismatics.” Many collectors enjoy building commemorative coin collections for both pleasure and profit. For both the experienced and novice coin collectors, there are few coin types that are as special and exciting as commemorative coins. Buying and collecting commemorative coins can be a source of great enjoyment, but they also do a lot of good for our nation. Since they are priced above their face and intrinsic gold and silver value, the extra money goes toward supporting public work projects, like museum construction, national monument maintenance, Olympic program funding, and much, much more. 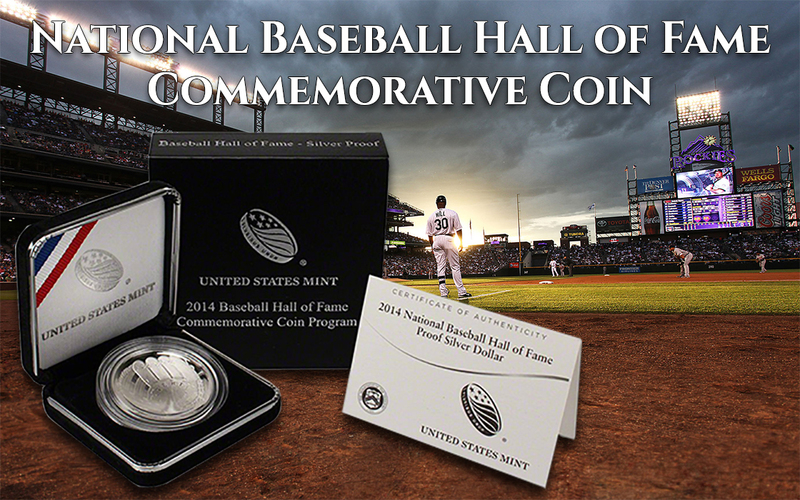 ­Commemorative coin programs help raise money for many important causes. When a new commemorative coin program is created, legislation is enacted by Congress which dictates the coin specifications, mintages, cost considerations, and adds a surcharge amount per coin to help fund important projects. The U.S. Mint distributes this surcharge money to designated recipient organizations, which must use the proceeds for the purposes specified in the legislation. Since the Modern Commemorative Coin Program began over 35 years ago, in 1982, the U.S. Mint has raised more than $500 million in surcharges to help build new museums, maintain national monuments like the Vietnam War Memorial, preserve historical sites like George Washington’s home, support various Olympic programs, and much more. 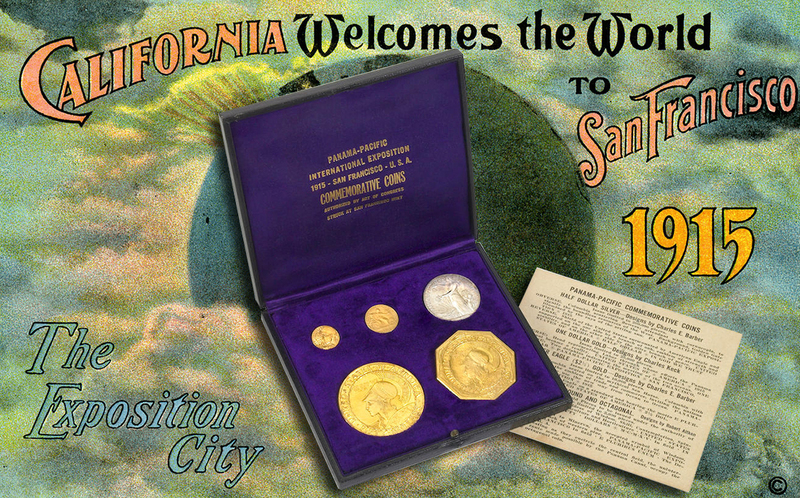 The United States Mint officially launched commemorative coinage in 1892, however, 44 years earlier, a very special “one-of-a-kind” commemorative coin was minted back in 1848, struck from the newly discovered gold in California. In August 1848, a special shipment of 228 ounces, measuring over 14 pounds of gold was shipped to the Philadelphia Mint, to be tested and refined in order to determine purity and to confirm the discovery of gold in the far West. 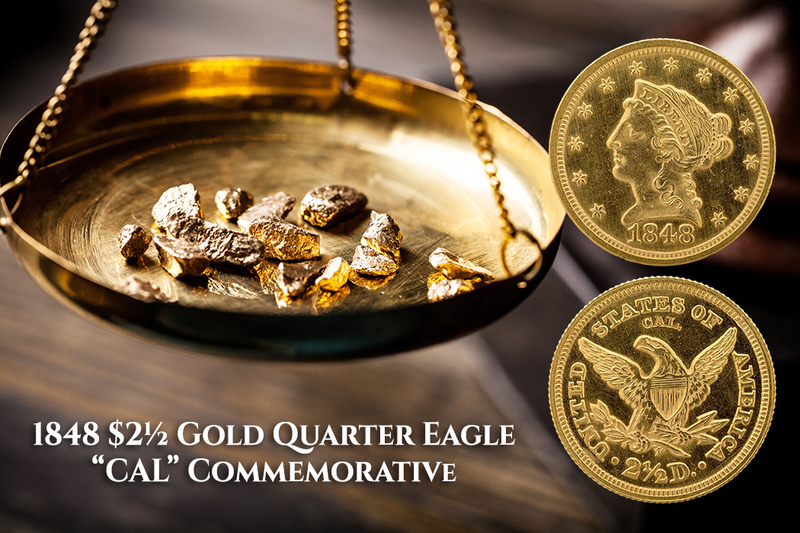 After the testing, the majority of this first California gold was used to make only 1,389, 1848 $2½ Gold Quarter Eagles as a commemoration of America’s significant gold discovery, technically making these “CAL” stamped gold coins the very first commemorative coins issued by the U.S. Mint. 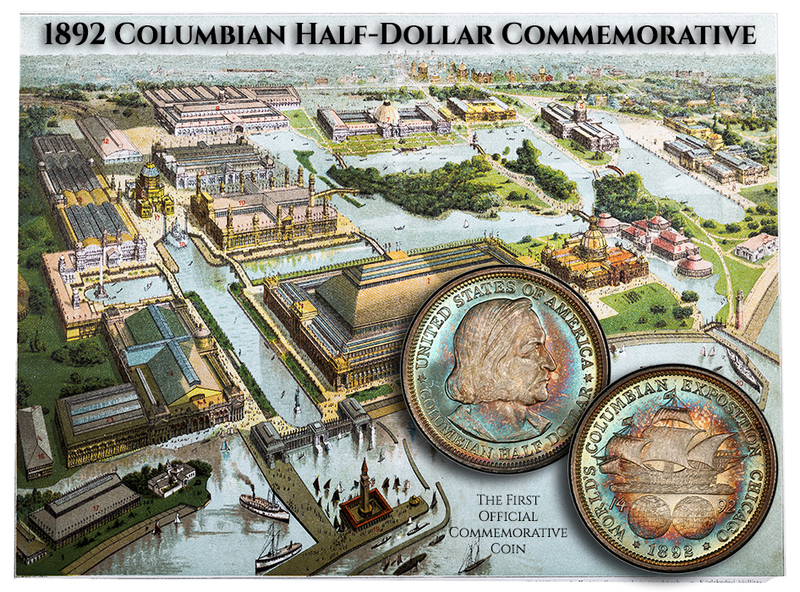 The first official commemorative coinage was introduced by the U.S. Mint was at the 1892 World’s Columbian Exposition with the Columbian Half-Dollar, commemorating the 400th anniversary of Columbus' discovery of America. These coins were sold for $1 at the fair, and nearly one million examples were sold in the first year. The following year, the Columbian Exposition quarter dollar, featuring Queen Isabella of Spain, was issued. The profits from the sale of commemorative coins were often used to fund a specific project. Commemorative coins were a money-raising mechanism that provided an alternative to raising taxes. In the 62 years, from 1892 through 1954, subsequent legislation authorized the U.S. Mint to produce commemorative coins for 53 different events, occasions, or individuals. This resulted in the Mint producing over 180 silver and gold commemorative coins. Early Commemoratives have become one of the most popular series in recent years. There are 144 varieties of silver issues, of which all but two, are half dollars (one is a quarter, the other is a dollar). Many collectors build type sets, which include 50 issues. Although some silver Classic Commemoratives can be very scarce and valuable, other Classic Commemoratives are quite affordable, even in high grades. It is no wonder that this interesting series has steadily gained popularity over the years. 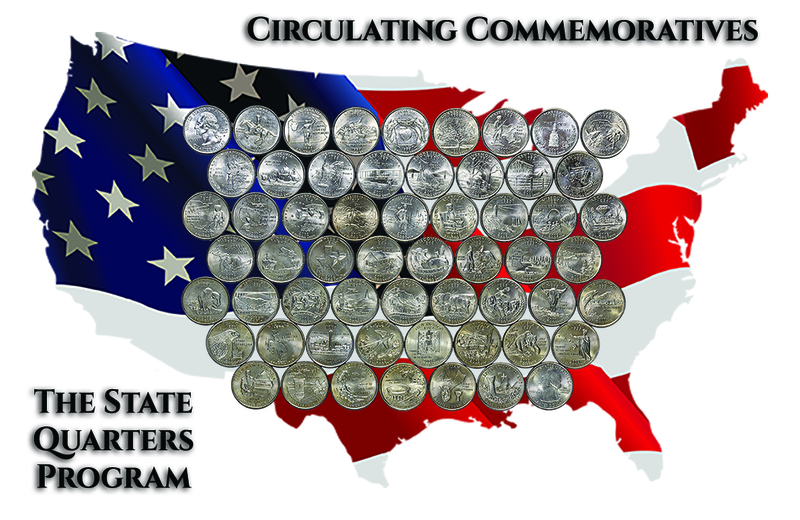 In 1982 the United States Commemorative Coin program was re-started. The program was kicked off with the Washington commemorative half dollar, marking the 250th anniversary of Washington’s birth. 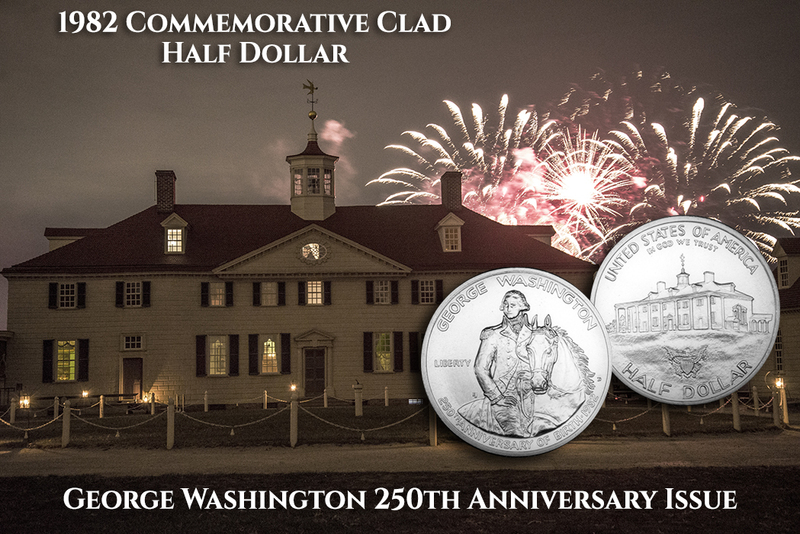 Since then, many exciting commemorative coins have been produced by the U.S. Mint to commemorate an event or place. Today, there exist numerous varieties that are sure to thrill any collector, buyer, or seller. 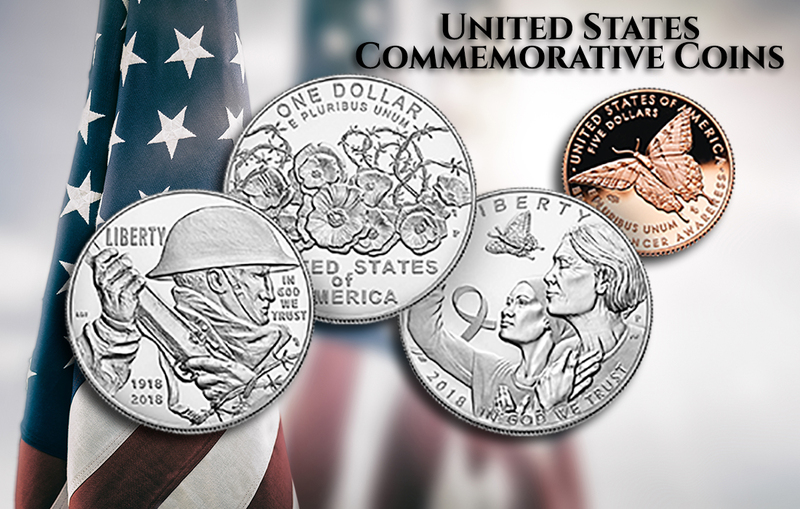 Each commemorative coin is crafted to be rich in symbolic American history. They not only represent an investment in maintaining our Country’s past but also in ensuring America’s future. Unique among U.S. Mint products, commemorative coins help raise money for important causes as well as commemorating important aspects of American history. These precious metal products not only provide beautiful additions to any coin collection, but they also capture the American culture as monetary art. There is such a wide variety of subject matter on U.S. commemorative coins that almost anyone can find something of interest to collect. Military themed commemoratives are quite popular, as are Boy Scouts and patriotic themed coins. Sport themed coins have mass appeal from Olympic events to the Baseball Hall of Fame Commemoratives. Commemorative coins also have mass emotional appeal to some, like coins about Breast Cancer Awareness, March of Dimes, and Civil Rights. 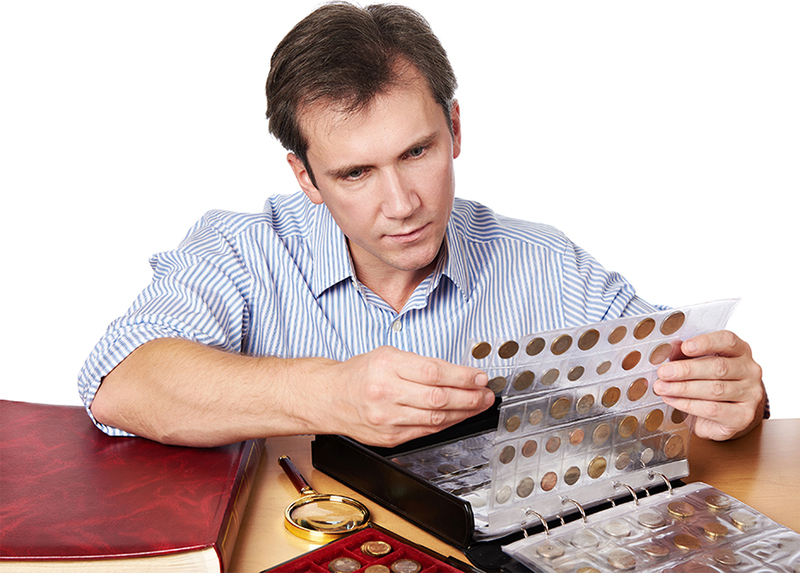 No matter what your interest, there is something there for everyone when collecting commemorative coins. Additionally, there are different finishes like uncirculated and proof, in different metal types, like gold, silver or clad, ranging in price from $25 to $250 and up. Some collectors choose to collect only one type of finish, like proofs. While some more advanced collectors may choose to collect all variations and different mintmarks, from Philadelphia, Denver, San Francisco, or West Point Mints. Some United States commemorative coins are intended to enter general circulation and to be used for daily commerce. These commemorative coins are also minted to commemorate a particular person, place, event, or institution, but the design will only be issued for a limited time and is intended to draw some attention to a specific commemorative initiative. Circulating commemorative coinage is responsible for bringing entirely new generations of youth into the hobby of coin collecting. There have been many circulating commemorative coin designs over the years, each with a specific message and purpose. • 1932-1998: The Washington Quarter started out as a circulating commemorative to celebrate the 200th anniversary of the birth of George Washington, after which it became a regular issue. • 1975-1976: U.S. Bicentennial commemoratives were dated 1776–1976, despite being produced throughout 1975-76, these included the Washington quarter, the Kennedy half-dollar and Eisenhower dollar. • 1999-2008: The State Quarters program was a 10-year initiative that honored each of the nation’s states in the order that they ratified the Constitution or were admitted into the Union. • 2004–2005: Westward Journey Nickel Series celebrates the 200th anniversaries of the Louisiana Purchase and the Corps of Discovery, with four commemorative nickel five-cent pieces. • 2007-2009: Six quarters commemorating the District of Columbia. The Commonwealth of Puerto Rico, Guam, American Samoa, the U.S. Virgin Islands and the Commonwealth of the Northern Mariana Islands were added to the program and issued in 2009. • 2009: The Lincoln Penny had four different reverse designs to celebrate the 200th anniversary of Abraham Lincoln’s birth, but also the 100th anniversary of the Lincoln cent, first appearing in 1909. The themes on the reverses represent the four major aspects of Lincoln’s life. • 2010-2021: The America the Beautiful Quarters Program had 56 quarter-dollar coins featuring designs depicting national parks and other national sites with five coins a year through 2020 and a final coin in 2021.